Right from the get-go, I liked this man's sense of humor. Great, I thought, a serious subject with a lighter side. 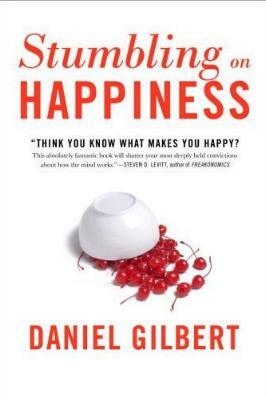 I think it's safe to say we're all seeking and dreaming of happiness in our lives (I know I am), and author and award-winning Harvard College Professor of Psychology Daniel Gilbert says of his book, "...this is not an instruction manual that will tell you anything useful about how to be happy." He goes on to say, "...this is a book that describes what science has to tell us about how and how well the human brain can imagine its own future, and about how and how well it can predict which of those futures it will most enjoy." He picks out things we humans all do, and with witty explanations, spells things out for us in a not-so-scientific way. He talks about "happiness" and how differently we think about it. Of course happiness is totally subjective and I enjoyed his explanation thereof. His book is divided into these parts: Prospection (looking forward); Subjectivity; Realism; Presentism; Rationalization, and Corrigibility (our saving grace). The dust jacket says, "Vividly brings to life the latest scientific research in psychology, cognitive neuroscience, philosophy, and behavioral economics, Gilbert reveals what scientists have discovered about the uniquely human ability to imagine the future, and about our capacity to predict how much we will like it when we get there." Not as scientific as it sounds. Unfortunately, I didn't get to complete this book - reviews are piling up around me, and having just signed up to write my second book, reading time is now severely restricted. Visit the www.stumblingonhappiness.com website. Conclusion - Extremely interesting and thought-provoking. This book will make you think about what and how you perceive things in your world.